Chlorine is essentially a chemical element that comes can come in the form of a solid, gas or liquid. Chlorine gas can be mixed with water in order to disinfect the water to a degree. Municipalities across Canada and the United States of America tend to inject chlorine into the water in order to kill bacteria (Coliforms, E.coli etc) and microbiological organisms (Giardia). The use of chemicals is successful in eliminating these contaminants, however there are some potential side effects to this approach. How Can I Filter Chlorine from My Water? 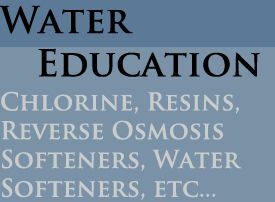 One option to removing chlorine from the water is a Reverse Osmosis System. 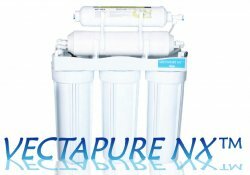 Systems like our Canadian Assembled Vectapure NX 5 Stage 75GPD Reverse Osmosis System filters/reduces Chlorine along with THMs (Trihalomethanes), Fluoride, and Amonia from your drinking water. R.O systems use a process in order to filter these contaminants from the water and dispose of it through a drain. For example, the 5 stage system filters water through a 5 micron sediment filter, a 10 micron carbon filter, a 5 micron inline carbon filter and finally the water passes through 0.003 micron membrane. The treated water then goes to a pressure tank in order to store the R.O water and finally passess an inline polishing carbon filter. The Reverse Osmosis water (with a Total Dissolved Solids rating of less than 10 parts per million) is supplied to a faucet, and or refrigerator. This is generally the most effecient way of removing chlorine from your drinking water. 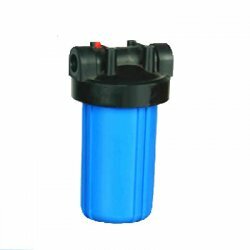 Automatic Backwashing Carbon Filters are a great whole-house filtration option for removing chlorine your water. Units like our Canadian assembled Purifiner Automatic Backwashing Carbon Filter act like a 20 micron carbon filter which filters chlorine, THMs (triahlomethanes), bad tastes and odours. The carbon in these filters last longer than a standard carbon filter because the unit has the ability to backwash and clean itself automatically and also have better flow with less restriction. The Erie electronic head allows these units to be cusomized to each individuals needs and can be set to regnerate after a certain amount of gallons and/or a set amount of days. The PCF Systems are low maintenance and do not have any pre-filter or post-filter screens that need to cleaned or replaced. In addition to removing chlorine and THMs, The Purifiner Carbon filters will also filters a number of bad taste and odours from your water. This is generally the best option for removing chlorine from the whole-house water supply and is the most feasible in the long run. Inline housing filters are another option to removing chlorine from your water. Housing units like our Big Blue 10 inch Whole House Filter Housing are a cheaper alternative to removing chlorine from the whole house. They can be installed easily in the basement, or wherever your water comes in, and can hold standard carbon filters like the EPM-BB 10 Micron Carbon Filter (along with sediment filters, specialty filters etc). The inline housing filters also come in a variety of sizes to meet each individuals needs. The issue with using inline filters to filters chlorine is that the filters may need to be changed too often which can cost you too much money and time in the long run. In some instances, customers only have to change the filter semi-annually, however in most cases even the 20 inch carbon filters installed as a post-filter only lasted a month before needing to be replaced.